I finally made it! This is my second attempt on a chocolate swirl bread...it is definitely much better than my previous attempt. I realised that in order to prevent the chocolate from oozing out from the dough, the texture has to be right. The first time when I did the chocolate paste, it was too soft. The trick is to cook the chocolate paste till very thick and almost dried out...forming a big lump. The texture is almost like a soft cookie dough. As I needed to use up my whipping cream before it expires, I used the Hokkaido Milky loaf dough instead of the dough recipe from the chocolate swirl bread. I made the chocolate paste while the bread maker was doing the manual work of mixing and kneading. Here's how the dough looked like when it was plaited, ready for the second proofing. The dough rose beautifully during the second proofing, but my shaping skills need further improvement. I wasn't able to achieve an even loaf...one of the sides was smaller than the other! I didn't really follow exactly how the dough was supposed to be rolled and shaped as given in the chocolate swirl bread recipe. Instead I adopted the rolling and shaping method of a basic danish bread. I was also too lazy to chill the dough in between the shaping, rolling and folding...I simply did it in one shot and let it proof. Luckily, the marble effect turned out great. 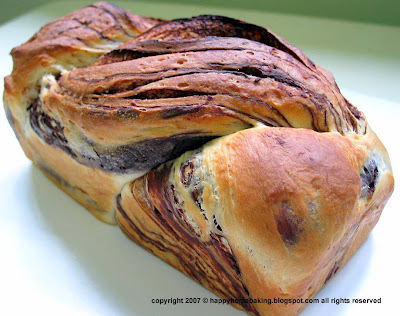 and here's how I did my quick and easier version of the chocolate swirl bread. Mix sugar and cake flour into the egg white until smooth. Place milk in a saucepan and heat till just simmering. Add coca powder into the milk and stir till cocoa powder is incorporated into milk. Add egg white mixture into the cocoa mixture and stir over low fire till mixture thickens and form a thick lump. Add in butter and stir till incorporated. Leave to cool. Place in a plastic bag and roll into a square (about 14cm x 14cm). Keep refrigerated before use. Place all ingredients in the bread pan of the bread machine, according to the sequence stated in the instructions of your bread machine. Select the Dough function to knead and proof the dough (about 1hr 30mins). Take out the dough and punch out the gas produced. Roll out the dough into a rectangle (about 45cm x 20cm) on a lightly floured work surface. Place the chocolate sheet on the middle of the dough. Wrap both ends of the dough over to cover the chocolate sheet completely. Take note that the dough should be rolled long enough for both sides to fold over the chocolate sheet, leaving a border edge of about one inch. Seal the edges tightly. The dough should now be about 15cm x 20cm. Roll dough from centre to the edges to form a rectangle (about 45cm x 20cm). Do this gently to prevent the chocolate paste from oozing out. Fold the dough into 3 folds. Finally, roll dough to 30cm x 15cm. Make a cut in the middle (length wise) leaving an inch uncut. Twist and plait. 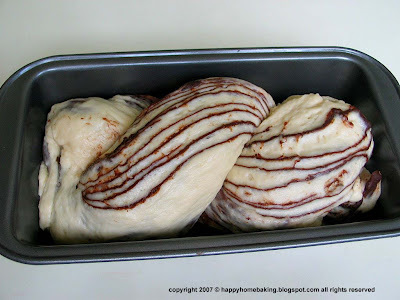 Place plaited dough in loaf pan and let proof for another 30mins or until the dough rise to about 80% of the loaf pan. Preheat oven to 200 degC but bake at 180 degC for about 35 - 40 minutes. Remove from oven and unmould immediately. Let the loaf cool off before slicing. That looks wonderful! As soon as I find some time, this is happening in my kitchen. Oh gosh, the bread looks so enticing! Love the perfect swirls! I'd love to try this out, but I don't have a breadmaker. Is it possible to do it without any? Wow!!! I'm speechless - this bread looks amazing! Those chocolate strips are perfectly distributed! hey HHB! i tried baking those durian muffins!! but then ah, they're salty?! i don't know why, but i think it might be due to the salt and baking powder! i used measuring spoons and the teaspoon looked quite big.. nevertheless, they don't taste half bad for a first attempt! i'll try harder next time! thanks for your recipes!! wow! this bread looks stunning! Well done! Hi Beth, thanks! I am sure with your experience, you can come up with something better than what I've done :) With different foldings and shaping (for example, using 3 plaits instead of 2) will yield different marble or swirl effect! Hi Ovenhaven, you can sure made these without a bread machine. I've used the bread machine to take care of the kneading and proofing so that I can have time to do other things :) You can place all the dough ingredients in a mixing bowl to mix and then knead by hand. Just take care not to place the yeast near the salt...and I think the fresh milk, whipping cream and eggs have to be in room temperature if you are mixing by hand. lafillefolle, I didn't have the problem with the salt...I couldnt taste the salt in the muffins. Maybe you could reduce the salt next time? I can't wait to try again too! Oh wow! That looks amazing! I love the swirls and the way it's twisted on top. The chocolate swirls are really pretty :) Well done! this is really lovely. I really like the swirls and the bread look so fluffy. Superb! I bet it tastes great. a) in Step 2....wrap both ends of dough to cover choc sheet...do u mean the 20cm sides on the Left n Right? b) in step 3....roll dough from centre to the edges to form a 45cm x 20cm rectangle....do u mean roll out from centre to the Right n Left of the 20cm sides( of the 15cm x 20cm rectangle )? I did refer to the photos in the original recipe but they kinda dun make sense. I will follow ur way. Thks, HHB! Btw, whts ur name? HHB is such a mouthful! I tried this recipe. Somehow I have problem rolling out the bread dough, no matter how I roll, it still remains very thick. Then after I bake it, i realised that the bread is not as fluffy as w/o rolling. Do i need a longer waiting time after I roll it? I wonder how ppl manager to roll the bread dough to so thin to make those mini rolls....any tips? Hi Anonymous, it could be due to the kneading. You have to make sure that the dough is kneaded till it becomes smooth and very elastic. Take a small piece of dough and try to pull it, it should not tear off easily and your should be able to stretch it till very thin without tearing. thanks, I will try tt again. Btw i am also using the same brand of bread maker. Usually after letting the machine knead for 30 mins, I do not hand knead it further (due to laziness :p) do you have to hand knead it to get the right texture? Do you think this will bake nicely in a pullman tin, baked with lid on? I don't quite understand when do we use a pullman tin and when do we bake in a normal loaf pan. I remember you commented on someone's blog that the top of the bread would be very hard if it is baked uncovered. How about the texture of this bread? Was the top hard too? 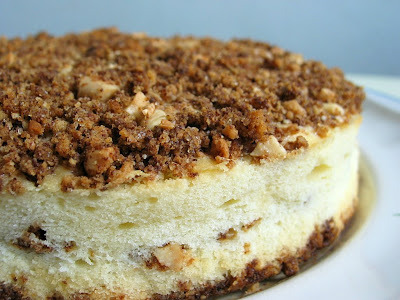 I really wanna try baking this. Thanks a lot! For this loaf, I baked it in a loaf pan without the cover. I personally think it is better to bake without the cover so that you can see the nice patterns/swirl on the top of the loaf. Basically I use a pullman tin and bake the loaf with the cover if I want to make a square sandwich loaf. Otherwise, I will bake without the cover, to achieve a 'mountain-shape' loaf. This bread is soft and the crust was not hard with just a little crisp. I am sorry, but I can't remember which blog I have made that comment. Do let me know so that I can take a look at what I have said, as most bread (except a square loaf) can be baked without the lid. But this is with reference to the plaited loaf(your playdough post). I guess guessing hard crust is obtained on a case by case basis. Yes, I did tried another recipe from the same author...I baked w/o the lid, and the crust turned out a little too hard...which don't seems to happen to other recipes? 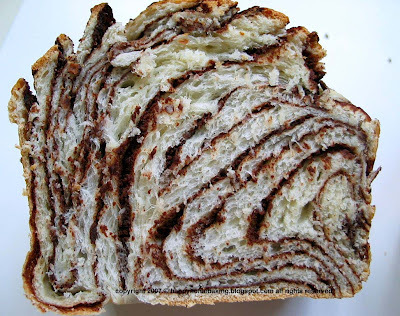 Wow, I love the look of those chocolate swirls in the bread! This is the first time that I've come across your website and it is fantastic. 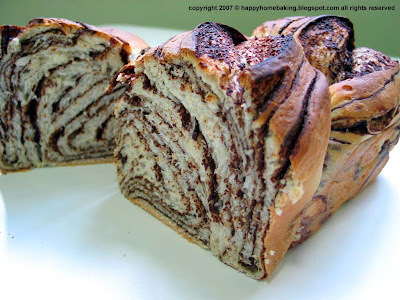 My parents love 綿綿土司-style breads and I am going to try your recipes (especially this chocolate swirl bread!) to bake for them. Thank you for all of your hard work in translating, typing up and sharing these recipes! I love your blog, such a daily ispiration! Just a question: half an egg in bread dough means an entire egg previously batted and poured together with the liquids (just the half you need). I think this is quite obvious to everyone but just in case, is that way or I have to divide half yolk and half white without mixing them? Can i use milk only instead of whipping cream? Hi, this bread recipe is made with whipping cream, I am not sure whether you can replace it with milk. I suggest you use another bread recipe (posted under "Milk Loaf"), but follow the shaping method as outlined here. Hope this helps. Can i use your sweet buns recipe to make this bread? If can do i need to double the recipe? Hi, I have not tried using the sweet buns recipe for this. You can give it a try. I am not too sure which recipe you are referring to when you ask about doubling it. For the sweet bun recipe, I use halve the original recipe, which is equivalent to this dough recipe. Hope this helps. Hi, do u cater to order? am hoping to order from u, but would like to make special request to modify the recipe such that the bread is made as low fat as possible. My family's live on a fat-free diet and takes only low fat types of foods the most, yet it's very difficult to find bakeries or confectioneries who can cater to our special dietary requests. Thus, our resort is to seek home bakers.. Do let me know if u're willing to help. Thanks aplenty. Hi evesauraus, thanks for your enquiry, I am sorry I do not bake for sale as I am not a qualified or professional baker. I hope you are able to find someone who can cater to your diet, cheers! hi there, do you have any bread recipe without the need of a bread maker machine? Hi luvablekids, all the bread recipes posted here can be made by hand. Instructions on how to knead by hand can be found in recipes such as "Matcha Red Bean Loaf", "Sweet Buns", "Chocolate Marble Bread II", etc. Hope this helps. thank you...will try out as soon as I can find time :)have a great day. I've just found out about your blog when i was looking for bread recipes and i tried the recipe above. but instead of baking it into a loaf, i made individual buns. unfortch, it didn't come out quite as i expected. the crust was rather thick and the bread was kinda dense and dry. i tried to follow ur recipe as close as i could, except that i used my kitchenaid dough hook to knead as i don't have a bread machine. i knead for abt 20-25 mins on speed 2. this is my 2nd attempt at baking bread. the first one was as hard as rock. may i noe what's the common mistake ppl make? i might have done the same thing. and does it matter if i make it to smaller buns instead of loaf? coz i tried to do the layering, i couldn't get the dough to flatten and make it into rectangular shape, it keeps pulling back to it's original shape. so i just fold the choco paste and made the dough into a ball. Hi Cara, I suspect the dough was not well kneaded. Did you knead till the dough pass the window pane test? ie the dough can be stretched and pull into a thin membrane without tearing? Buns will tend to be slightly denser in texture than a loaf bread...you can compare a soft bread roll with a slice of sandwich loaf...the texture is different. I think you didn't let the dough 'rest' enough...you need to leave it to relax (for 15-20mins) so that it will be easier to roll out without it shrinking back. This bread is not that easy to make...as the chocolate paste has to be the right consistency for it to roll together with the dough. Maybe for a start, you may want to try with simple sweet bun recipe? thanks for ur reply! yea i think i didn't knead enough cuz i thot half an hr is quite long already. btw when u said leave it to relax, after which stage? after the kneading or the proofing just before baking the bread? Cara, after the first proof, you will need to punch down the dough to release the air. Then smooth it into a round ball, and let it rest for 15-20mins, before shaping (rolling out, etc) it. In between rolling, if the dough is still very elastic (ie keeps shrinking upon rolling), you can also leave it (covered) for 5 to 10mins to let is rest...and it will be easier to roll and won't shrink that much. After you have shaped the dough into buns or loaf, you need to let it proof the second time before baking. This looks amazing! 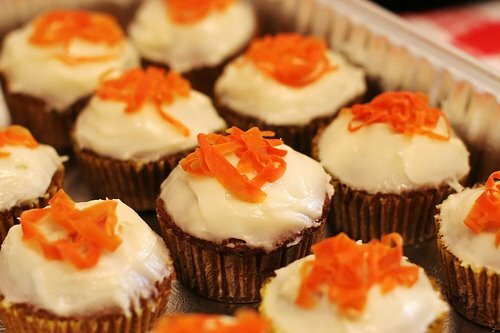 I have to try this and be more adventurous with baking and you make it look so delicious and easy! Thanks for sharing the recipe. Hi HHB, is the whipping cream the non-dairy type? Hi JerJer, I used dairy cream. Hi Harmony, I don't think it will be easy to use cinnamon filling, I am afraid the dough will be quite difficult to handle. Hi, HHB, can i use the Nestle pure dairy sterilised cream to replace the whipping cream? Or the redman whip topping cream? Both r sweet compared to the non-dairy whipping cream so i m not sure how it'll affect the taste of the bread. Thks. Hi Jer, do use dairy whipping cream for this recipe. Besides the taste, whipping cream has got the fat content which helps to make the bread soft, the texture will be affected if you were to replace it with non dairy cream of pouring cream. Hi Jer, you can use the Dough function to knead the bread. The dough function will need the bread continuously for 20mins without stopping in between. Yes, you can run it for two rounds especially if the dough is wet and sticky. Hi Valentina, I baked this using a loaf pan, 8.5"x4.5"x2.5"(inches).